Sunday, April 10, 2011 we met at OZ7SAT to start working on our antennas. The weather is becoming better and we have a few plans for upgrading the antenna farm at AMSAT OZ headquarters. On July 11, 2010, a total solar eclipse could be observed in the southern Pacific Ocean. 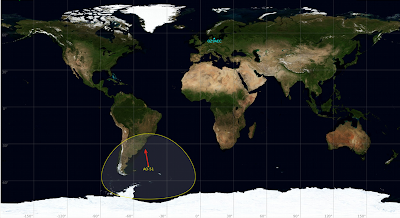 During the eclipse, the AO-51 amateur radio satellite was entering daylight, coming in over South America. When AO-51 enters daylight the solar arrays start charging the batteries. 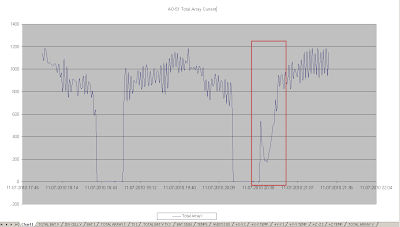 This can be observed in the telemetry as a sudden increase of the current from the solar arrays. This time; however, a sudden drop in the current was observed shortly after the current started to increase, see the graph below. The time and place where this unexpected drop occurred suggested that the satellite might have experienced the solar eclipse that was about to happen over the southern Pacific. It was Masa san, JN1GKZ, who noticed this and reported it on the AMSAT BB where after Mark, N8MH sent out the telemetry graph shown above. A quick simulation using the Celestia space simulator confirmed that this was indeed the case. The video below shows how it may have looked like from the satellite. Watch on Youtube or download H.264 encoded .mov file (~100MB). Unpack the ao51.zip file to the “extras” folder of Celestia, start the program and find AO-51 (type ENTER, AO-51, ENTER, then press “g” to go to the satellite). Enjoy!